The widespread digitization of logistics is fueling the search for more efficient ways to ship, pack, and process goods. Companies all along the supply chain are finding ways to use big data and advanced machine learning technology to streamline processes and automate difficult tasks. One of the first arenas where AI gained a foothold was in the back office, where bookkeeping, HR, legal, and other departments engage in repetitive, detail-oriented tasks. Cognitive automation uses intelligent business processes to replace human clerical labor with software. These solutions use a series of structured inputs to sort unstructured data into something that can be processed more easily. For companies with large fleets or a network of facilities around the globe, processing and managing contracts is a serious challenge. Keeping real estate titles, leases, insurance policies, and other documents organized and up to date requires significant forethought and careful planning. AI contract management systems “read” lengthy legal documents, using natural language processing to classify and organize relevant sections, saving legal departments hundreds of man hours of tedious reading. Customs declarations rely on complex manual systems that require specialized knowledge of different industries, their regulations, and their customers. The information in customs declarations are cross-referenced and validated by companies and government agencies throughout the process. As a result, errors can be extremely costly. AI-driven customs brokerage could speed up international processing, saving logistics professionals from delays. By using natural language processing to extract relevant information from various documents, AI can produce an automatic declaration that meets all legal expectations. Forget the weatherman. Big data processing gives logistics pros up-to-the-minute insight into how weather patterns will affect the supply chain. AI technology exists that builds weather models based on historical and current meteorological data to assess bad-weather risk. More than just a weather report, this deep dive into available data is designed to be highly localized, and can be used to guide route planning decisions. These models help shippers decrease the impact of adverse weather on transportation. Predictive demand and capacity planning can help logistics pros prepare for busy seasons and booming trends. AI collects deep quantitative data from online browsing, YouTube viewership, and social media to track rising interest and tease out boom and bust cycles for new products. Next time a trend like hoverboards or Fidget Spinners comes around, AI-driven research can help manufacturers and logistics professionals get ahead of the competition. New customer demands present a lot of challenges for last-mile shippers. Next day delivery, ad-hoc pickups, and other innovations involve faster turnarounds and non-traditional route planning. Historically, logistics professionals have relied on their instincts and personal knowledge to guide shipments through crowded cities. Now, thanks to satellite mapping, traffic data, and social media, technology can help find the best route. Artificial intelligence can process massive amounts of drive-time data to determine how traffic will fluctuate throughout the day, providing the fuel for advanced real-time route setting technology that can help drivers get to their destinations faster. In any given warehouse, you’re likely to see dozens of employees moving product using manual equipment like pallet jacks and forklifts. AI is rapidly transforming these processes, helping to make the fulfillment process safer, faster, and easier. As noted by MH&L News, autonomous guided vehicles (AGVs) are already being used to transport product around warehouses without direct human oversight. Using machine learning, this technology allows vehicles to “talk” to one another, helping them decide on optimal paths and speeds. In addition, the algorithms that drive these vehicles become smarter and more efficient over time as they receive more data. Cognitive visual recognition technology will soon transform the way visual inspection is done in logistics. One valuable example comes from recent experiments on inspecting freight trains for damage. Using a camera bridge to observe cargo train wagons, AI was used to identify the kind of damage and pass the information along to maintenance teams. Similar technology could be used to inspect furniture and other product for damage in the future. Mechanical failures result in costly delays for companies all along the supply chain. Many breakdowns can be prevented with regular maintenance. However, tracking which trucks or ships need maintenance is a time-consuming process. To solve this problem, companies are starting to experiment with using IoT sensors to help managers monitor the conditions of their trucks and other equipment. 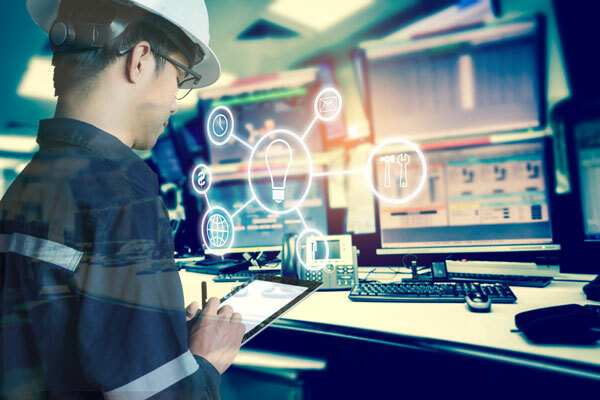 Data from these continuous monitoring solutions can be processed by AI algorithms to anticipate what will need repair and when, long before issues create a delay. From end to end, AI is already revolutionizing supply chain processes. Will your organization be on the leading edge, or lag behind? Discover how Globecon uses technology to empower their warehousing solutions. Contact us!